As a sculptor of constructive geometric forms, my work deals with patterns and relationships derived from classical ideals of balance and symmetry. Mathematical yet organic, these abstract forms invite the viewer to partake of the geometric aesthetic. I use a variety of media, including paper, wood, plastic, metal, and assemblages of common household objects. Classical forms are pushed in new directions, so viewers can take pleasure in their Platonic beauty yet recognize how they are updated for our complex high-tech times. I share with many artists the idea that a pure form is a worthy object, and select for each piece the materials that best carry that form. In one series of pieces, familiar objects are arranged in engaging configurations, displaying an essential tension between mundane individual components and the strikingly original totality. Because my works invite contemplation, slowly revealing their content, some viewers see them as meditation objects. A lively dancing energy moves within each piece and flows out to the viewer. The integral wholeness of each self-contained sculpture presents a crystalline purity, a conundrum of complexity, and a stark simplicity. wood covered in synthetic fur, base of epoxy composite over steel, painted with pink enamel. exotic hardwoods (yellowheart, paela, and padauk) with walnut "grout,"
Some of the above pieces are available for purchase. Contact me for more information or if you are interested in commissioning something special. Vorpal Gallery, 459 W. Broadway, 5th floor, Soho, New York City, Jan 1999-ongoing; (212) 777-3939. Art & Mathematics 2000, The Cooper Union, NY, Nov. 7 - Dec. 15 2000. Individual Artist Award, New York State Council for the Arts. 1999, to create Book Ball, a geometric construction of books celebrating the millennium. Award of Excellence, 10th Annual Juried Fine Arts Exhibition at Chelsea Center, 1998. "Loopy," Humanistic Mathematics, to appear, 2001. Craig S. Kaplan and G. Hart, "Symmetrohedra: Polyhedra from Symmetric Placement of Regular Polygons," to appear in Proceedings of Bridges 2001: Mathematical Connections in Art, Music, and Science, Southwestern College, Winfield, Kansas, July 2001. 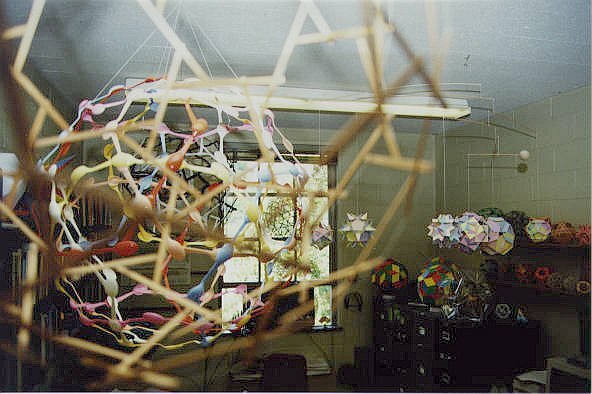 Douglas Zongker and G. Hart, "Blending Polyhedra with Overlays," to appear in Proceedings of Bridges 2001: Mathematical Connections in Art, Music, and Science, Southwestern College, Winfield, Kansas, July 2001. "Geometric Sculpture," ISAMA 2000, SUNY Albany, NY, June 24-28, 2000. "Computer Modeling and Construction of Geometrical Sculpture," U.C. Berkeley, Feb. 1999. 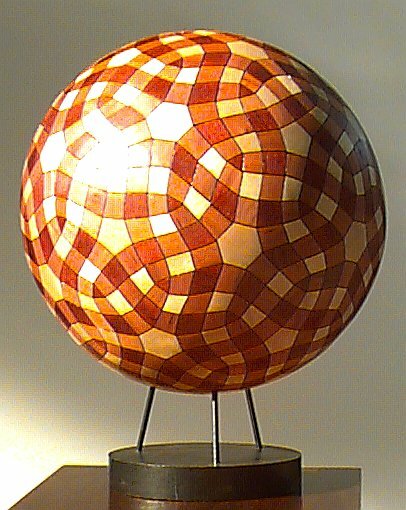 "Geometric Sculpture," Carpenter Center for the Visual Arts, Harvard University, Nov. 2, 1998. "Geometric Sculpture," New York Academy of Sciences, October, 1, 1998. "Paper Prototype of a Geometric Sculpture: Whoville," (Invited workshop presentation) Art and Math '98, U.C. Berkeley, August 3-7, 1998. "Polyhedra Models over the Internet", MAA Mathfest, Atlanta GA, August, 1997. "Applications of Virtual Reality and Java for Illustrating Polyhedral Geometry over the Internet," Conference on Electronic Communication of Mathematics, Geometry Center, U. Minn. June 1997. "Virtual Reality Polyhedra," Art and Mathematics Conference, SUNY Albany, NY, June, 1996. Check out a nice photo with one of my models which made the NY Times. Read an interview that appeared in studioNOTES. Read an interview that appeared in Ubiquity. See my entry at sculpture magazine. For background on the historical relationships between polyhedra and art, see the Polyhedra and Art section of my online Encyclopedia of Polyhedra. This was the topic of my talk at the 1998 Art and Math conference at Berkeley. I also make paper polyhedron models which are more at the mathematics end of the scale than the art end. Somewhere in between, I put my "geometric constructions," which blend math and art more evenly. Finally, you might also like to look at some of my 2D computer-generated images, which are concepts for sculptures too difficult to realize physically, or some of my early plotter drawings. If you like this stuff, here are some links to some other geometric sculptors you may like: Brent Collins, Helaman Ferguson, Bathsheba Grossman, Jean-Pierre Hébert, Chris Palmer, Charles Perry, John Robinson, Carlo Sequin, Arthur Silverman, Ken Snelson, Simon Thomas, Keizo Ushio, Koos Verhoeff. For more, see the International Society for Art, Math, and Architecture. There is also general information for/about sculptors at Richard Collins' www.sculptor.org site. Copyright 1997, 1998, 1999, 2000, 2001, George W. Hart. All rights reserved.